Welcome to Weebly Cloud! Weebly for Cloud is for resellers looking to provide customers a best-in-class website builder where they can create their own website, blog, and online store in minutes. Note: Weebly recently updated to TLS 1.2 and deprecated TLS 1.0 and 1.1. Please make sure your environment supports this change. Weebly for Cloud is for resellers looking to provide customers a best-in-class website builder where they can create their own website, blog, and online store in minutes. As the reseller, you maintain full control over billing, support, and the customer relationship. The Weebly Cloud platform allows you to easily integrate Weebly into your existing internal application, CMS or third party web application. You can use our Cloud Admin to manage users and sites or you can use our RESTful API to programmatically integrate with existing systems. You can also use plug-ins that allow you to integrate Weebly with existing systems. 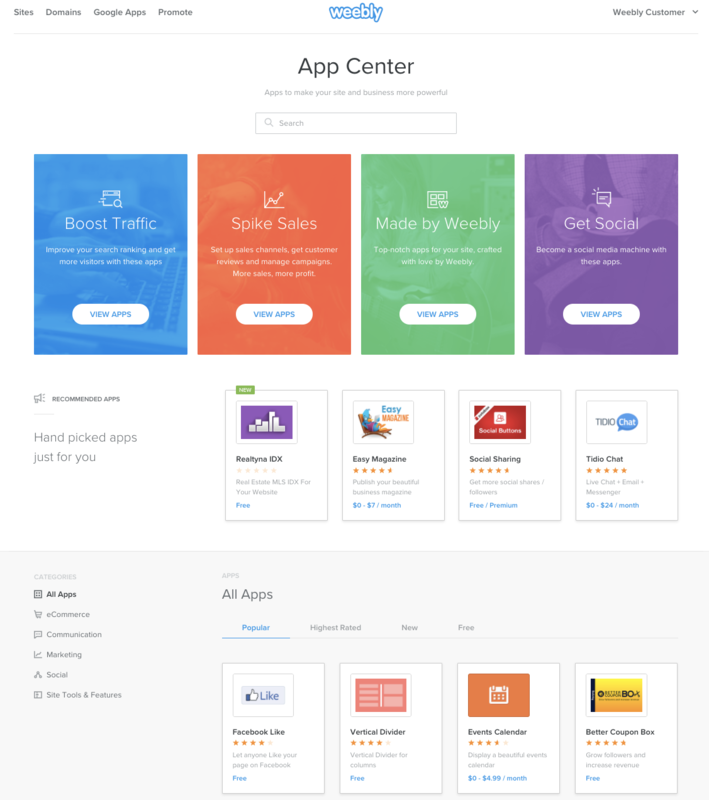 Note: If you are an App Developer looking to create apps to market in the Weebly App Center, please click here. Your first step is to get a Weebly Cloud account. This account gives you access to Cloud Admin where you can access your customer’s information, along with your API key and secret that gives you access to the the Cloud API. If you don’t have a Weebly Cloud account, then email our team here. Once your account is set up, head on over to Configure Weebly Cloud to finish setting up your account. When first getting acquainted with the Weebly Cloud, your account will be in test mode. There are no functional limitations while in test mode, it simply defaults any users and sites created to test so that you won’t be charged for them. Users and sites may be periodically removed from the system, but only after your Weebly Cloud account is in production mode. Note: Published sites in test mode are live and discoverable. Once in production mode you can still create a test user in the Cloud Admin or by passing the optional parameter of test_mode. Learn more about the User API. As a Weebly Cloud partner, you can either host the published sites on Weebly’s infrastructure or on your own. When hosted at Weebly, all files live on the Weebly server. When you choose to host, all requests are made to your server and all static files reside on your server. But some requests require a call to a Weebly endpoint to return certain dynamic content. In both hosting cases, the Weebly Editor (where your site owners create their sites) is hosted on Weebly. More info about hosting options can be found here. Many of the operations needed to manage your customers’ websites are accomplished using the Cloud Admin, including the ability to create, manage, and delete sites. You access the portal from https://your-domain/admin. Note: If your domain is a subdomain of weeblycloud.com, then you can also access the admin from https://weeblycloud.com/admin. Users of the Cloud Admin are called Team Members, and you can configure the access to functionality they have on the Team Member page. Your customers access sites through the Site Dashboard at https://your-domain/portal. Note: If your domain is a subdomain of weeblycloud.com, then you can also access it from https://weeblycloud.com/portal. 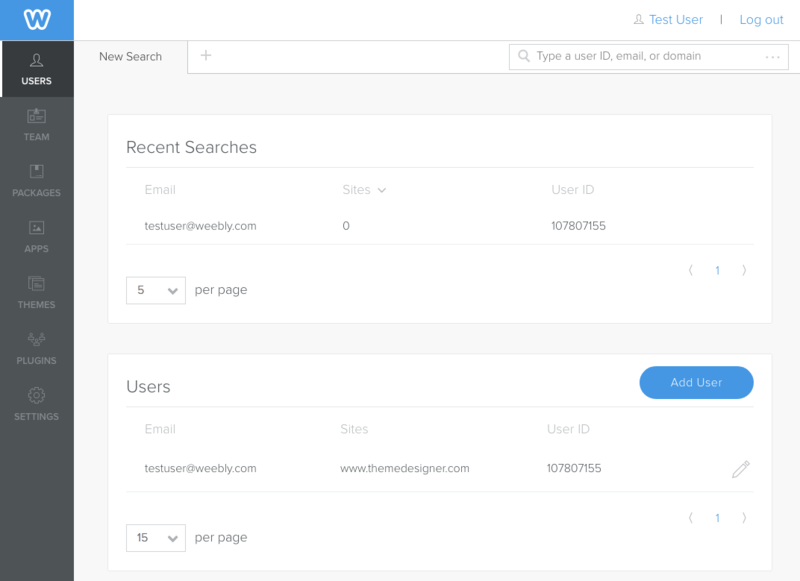 Here, they can view site stats, form entries, blog comments, and dashboard cards, sales, as well as access the Weebly Editor. If you have upgrades enabled, they will see upgrade prompts that will launch your Upgrade URL. 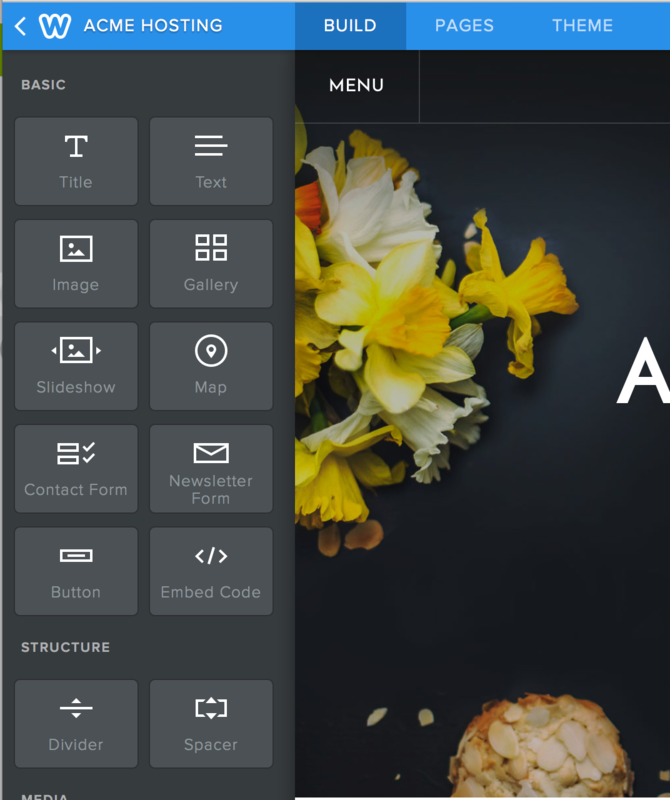 Your customers use the Weebly editor to design websites. 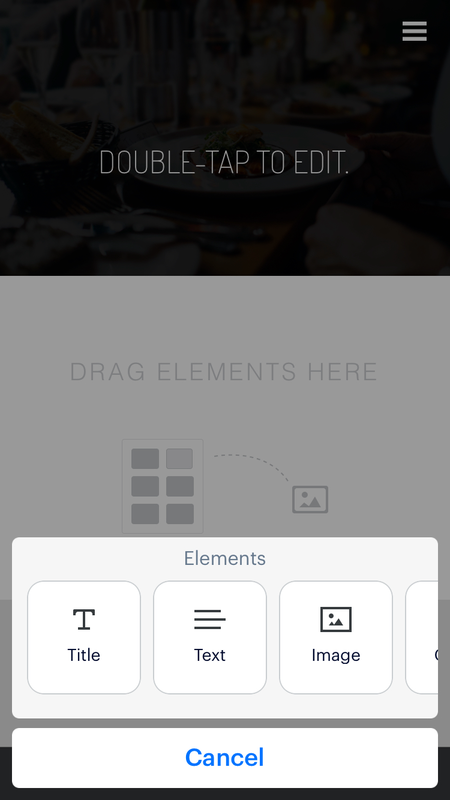 It’s as easy as dragging elements from the element tray and dropping them onto a page. You access the editor from the Site Detail page in the Cloud Admin. If you chose to allow it, your customers can use the Weebly mobile app (available on both Android and iOS) to build and manage their websites. You can make these apps available based on the plan a site uses. For example, you might only allow mobile access to sites on your premium plan. More on how to add mobile apps and how your customers can access them here. Note: The mobile apps are not white labeled. Your customers will see the Weebly logo. Your customers can add more functionality to web sites by visiting the Weebly App Center and downloading and installing apps created by Weebly and by third-party partners. ​Site owners can browse through collections, categories and sub-categories, can filter based on ratings, popularity, freshness, or for free apps, and can search using keywords. You can control whether or not you want your customers to be able to visit the App Center, and if you do, you can make the center available only to sites on certain plans. Additionally you can create your own apps and have them automatically installed based on the plan a site is associated with. More on the App Center and custom apps here. Note: The App Center is not white-labeled. That is, the Weebly brand appears throughout the center. A Weebly theme provides a general structure and design palette for any website built using the Weebly editor. Weebly strives to provide ultimate flexibility for our users, so our themes don’t dictate a template or a mandatory organization of content. Instead, they provide a beautiful backdrop for the site’s content. While we provide a number of themes, you may want to create your own. 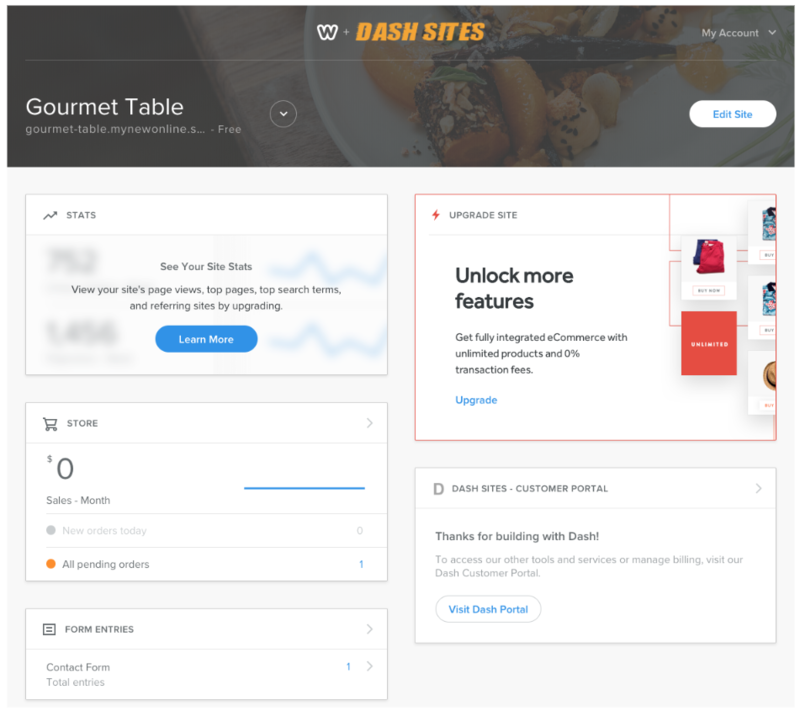 Because themes need to have very specific structures and files in order to work on the Weebly platform, instead of creating a custom theme from scratch, you can start with any theme and then customize it to meet your needs. We also provide a base theme that you can use as a start. More about customizing themes here, including a tutorial that walks you through the process. 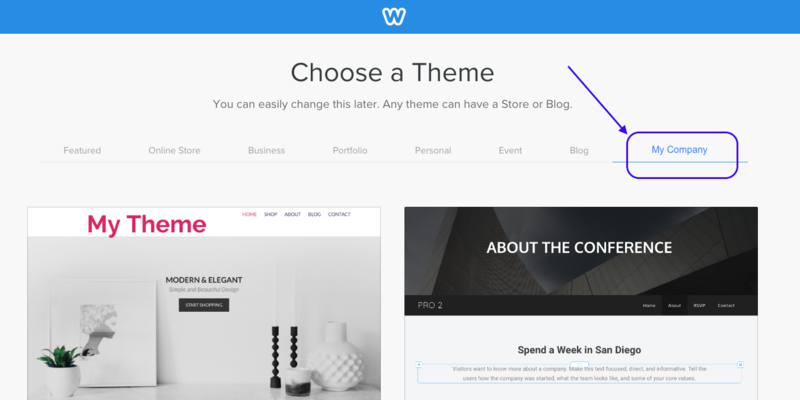 You can customize a theme directly from the Weebly Editor. 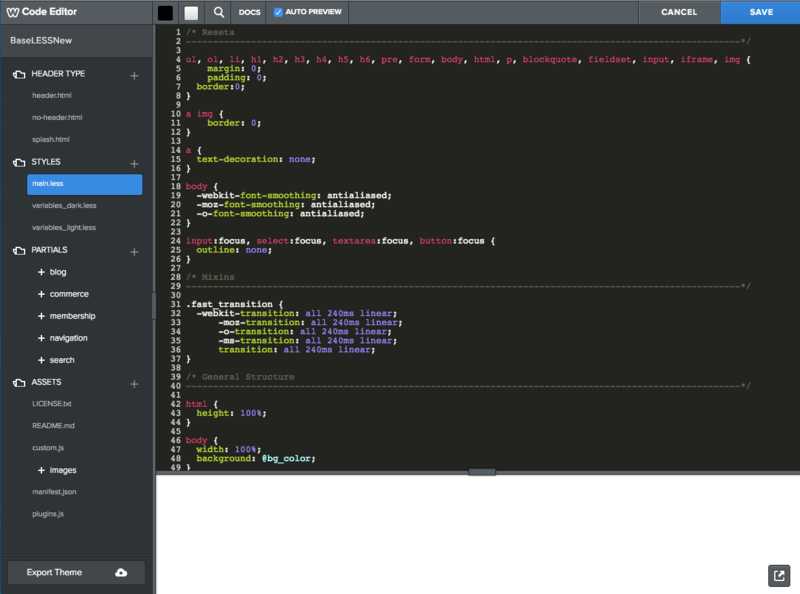 Click the Theme tab and then click Edit HTML/CSS to open the built-in Code Editor. ​​​You manage your custom themes from the Theme tab of the Cloud Admin. Any themes you add here are available for your customer when editing a site. If you have any questions about working with Weebly Cloud for Designers, or suggestions for how we can improve the Cloud Admin, the APIs, or the documentation, use the Submit Ticket link in the Cloud Admin. Once submitted, a ticket is sent to the Cloud support team.